Harley-Davidson World secured an exclusive promotion to create a one-of-a-kind Harley-Davidson custom motorcycle wrapped in OKC Thunder colors and graphics. Anheuser-Busch was then invited to partner by bringing it’s Bud Light brand to the promotion with their extensive market reach of locations allowing customers multiple opportunities to see the custom bike and enter to win throughout the month of March 2015. As the program planning developed, the decision was made that the most effective means of entry would be through text message or SMS. “There was never any question we wanted to execute this promotion using SMS as the means for entry. We’ve implemented a variety of mobile campaigns in recent years and the results have always been very positive”. Jason Barnes, Marketing Director for Anheuser-Busch of Oklahoma, said. “A solid state of the art backbone in running any campaign or promotion is vital in achieving your expected goal throughout the promotion; it will also provide you with the technology to be better engaged.” Silva said. 7 Media Group, a leading mobile marketing consultant and technology provider, was tasked with the managing the mobile strategy for this cross-platform promotion. By using SMS for entries it gave the brands opportunities to collect additional customer data for future promotions as well as a follow-up strategy after the promotion ended. Customers were only required to provide their date of birth for eligibility but throughout the promotion were given opportunities for Harley-Davidson, Anheuser-Busch And Oklahoma City Thunder Partner for Extensive Cross-Media Local Mobile Promotion additional entries by providing their zip code, name and email address. Silva said,”By asking for additional information it allowed us to get engaged with the customer on a more personal level during and after the promotion.”. Customers could also participate via an online form promoted on the Thunder website. 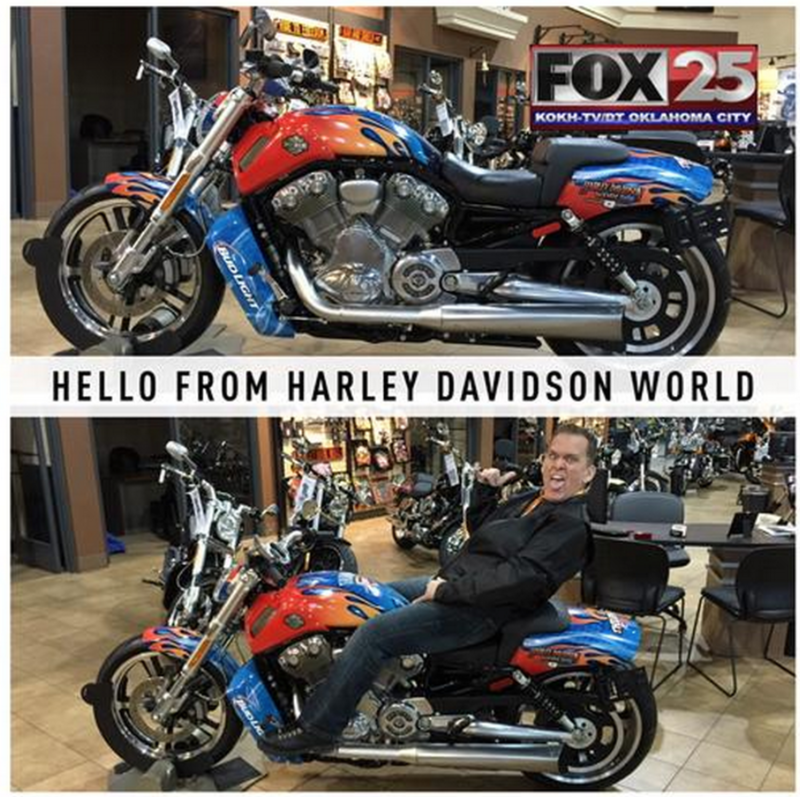 Harley-Davidson World kicked off the monthlong promotion with a live morning TV appearance on the local Fox TV affiliate in Oklahoma City. Viewers were able to get a first look at the custom bike and get the details of the promotion along with entry opportunities. Customers were instructed to simply text “THUNDERBIKE to 55678” to participate in the sweepstakes. The TV appearance was followed up with a strategically planned month of cross-media and location based marketing. “Planning and implementing a strategy that will benefit all parties involved in your promotion will greatly influence on how much your partners will be willing to participate.” added Silva. Multiple mediums were leveraged to get the most exposure for the promotion. Regional motorcycle enthusiasts publication, Thunder Roads Magazine, featured the custom bike and OKC Thunder cheerleaders on its March cover. A radio schedule ran on the market’s largest sports radio station and printed signage was displayed at the Harley dealership as well as 15 different bar and restaurant partners of Anheuser-Busch. The bike was also seen at 2 OKC Thunder home basketball games at Chesapeake Energy Arena in downtown Oklahoma City. The brands were able to monitor and measure participation throughout the month by utilizing a series of unique keywords assigned to each portion of the promotion. Silva said, “Constant monitoring of your campaign/promotion allows you to fine tune it as you go, using 7 Media Group gave us that flexibility”. Keywords for each channel of media were custom so that the brands could see where entrants were viewing or hearing the calls-to-action Throughout the month, thousands of entrants were sent follow-up SMS alerts directing them to locations where the bike could be seen and when new means of entry were possible. “We could have not done a promotion as broad as this without utilizing SMS. Our ability to continually update customers throughout the month with locations, specials and other ongoing details was vital to the overall success.” said Barnes. Customer engagement was decisively en- Harley-Davidson, Anheuser-Busch And Oklahoma City Thunder Partner for Extensive Cross-Media Local Mobile Promotion gaged with less than 1/2 of 1% of each outgoing message choosing to opt out of the promotion. The responses to additional data requests were also met with. 96% of entrants provided their zip code, which was vital to Harley-Davidson World in their follow-up strategy. Although not required for eligibility customers were given additional entries by sharing their First Name (58% replied), E-mail (52% replied) and Gender (45% replied). With an extensive background in traditional media channels such as radio, print, television and event planning 7 Media Group was able to apply a mobile marketing strategy for these recognized global brands with the best path to local success. By signing up you agree to receive automated marketing text messages from 7 Media Group at the mobile number above. Consent is not required to buy. Approx. 4-7 msgs per mo. Message & data rates may apply. REPLY 'HELP' FOR HELP, REPLY 'STOP' TO CANCEL.